What’s new at Academy of Medical and Public Health Services’ (AMPHS) headquarters? 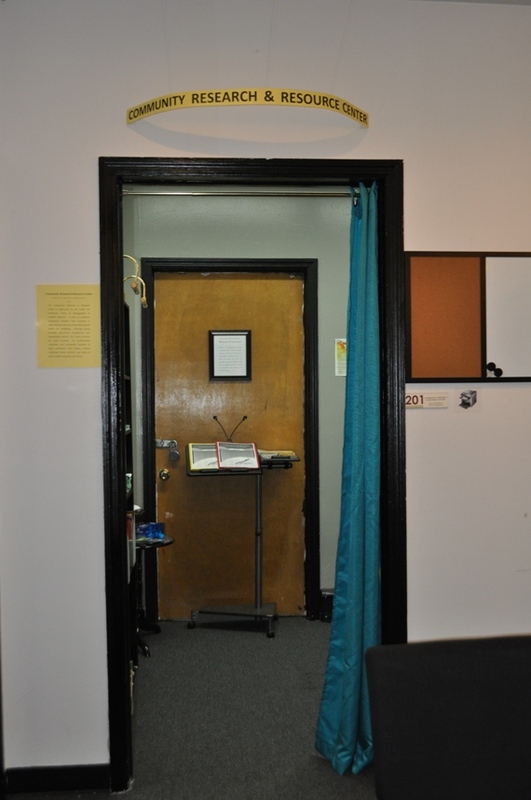 AMPHS’ Community Research & Resource Center got a make-over! Community members can stop by for a comfortable and private study on any medical condition known to man. 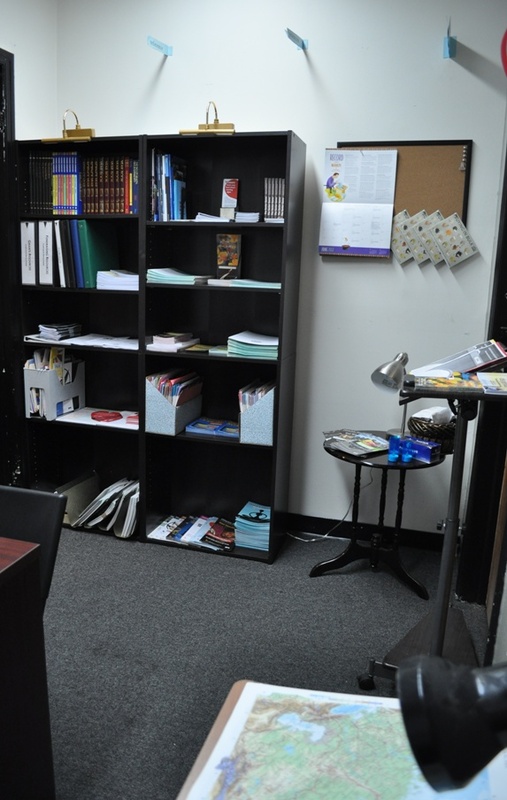 Using funds from their YouthBridge Grant reward received earlier this month, AMPHS re-modeled the resource center into a homely library room furnished with bookshelves, an office desk and chairs, desk lamps, and dark window curtains for private for in-depth reading. 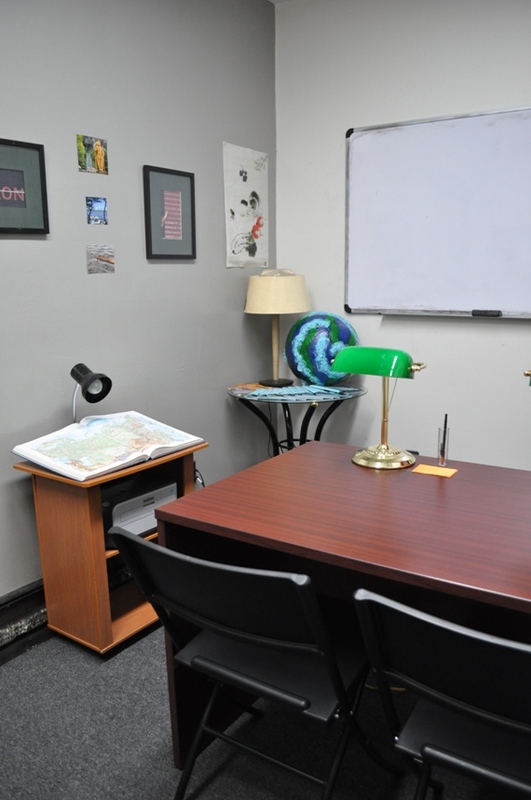 Re-located to room 201, the center is now larger, more spacious, and includes a printing station to print out referrals or online resources for community members. There are plans to install a computer terminal for community members to check their health status and re-cataloging the room to make it more user friendly for them. The Community Research & Resource Center is sponsored by the Center for Healthcare Policy & Management, which aims to provide community members access to resources that will assist them in making informed decisions about their general health and wellbeing. Through group seminars, one-on-one consultations, and independent research, the Center provides the tools necessary for community members to better understand their bodies, medical conditions, health concerns, and issues related to public health. Information community members can find in the Resource Center include an extensive collection of reference materials and resources outlining specific diseases, conditions, and health-related topics, comprehensive FDA information sheets, database for community members to take home, NIH News In Health subscription for public use to outline breakthrough research and treatment options. As part of the Center’s mission, AMPHS also gives public presentations and seminars on health access and coverage and prescription access. 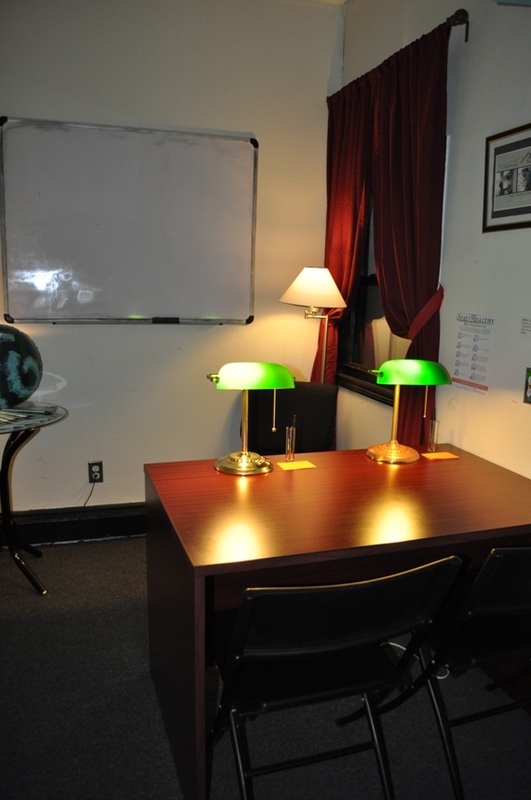 One can find the Community Resource Center at AMPHS’ headquarters located in Room 201 AMPHS NYC 5306 Third Avenue, 2nd Fl, Brooklyn, NY 11220. Let us know what you think about our re-modeled Resource Center. Send your comments! 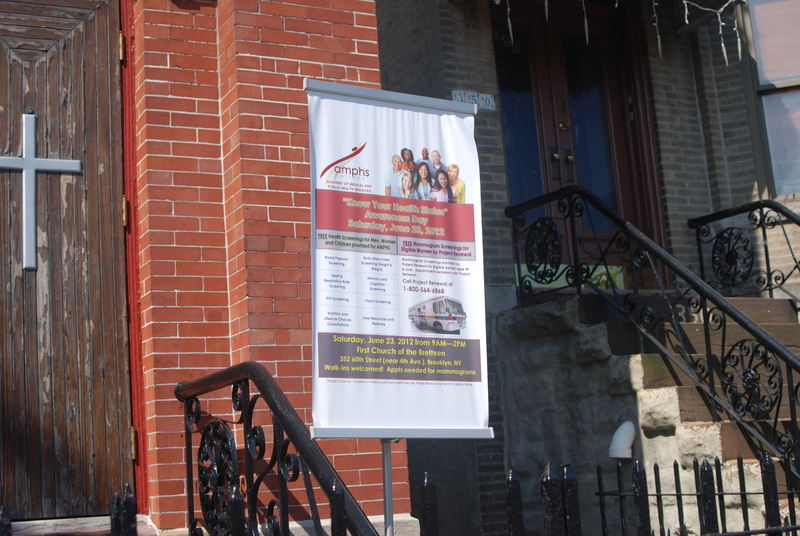 Brooklyn, NY – Academy of Medical and Public Health Services (AMPHS) in partnership with Pastor Jonathan Bream hosted its first health fair called “Know Your Health Status” Awareness Day Fair at First Church of the Brethren in Sunset Park, Brooklyn, this past Saturday, June 23rd. The AMPHS clinical staff provided free preventative health screenings such as: body mass index assessments (height and weight), visual acuity, pupillary reflex, and oculomotor function testing, blood pressure measurement, heart rate and respiration rate assessment, oxygen saturation assessment, memory and cognition screenings, nutrition and lifestyle consultations, and healthcare referrals. 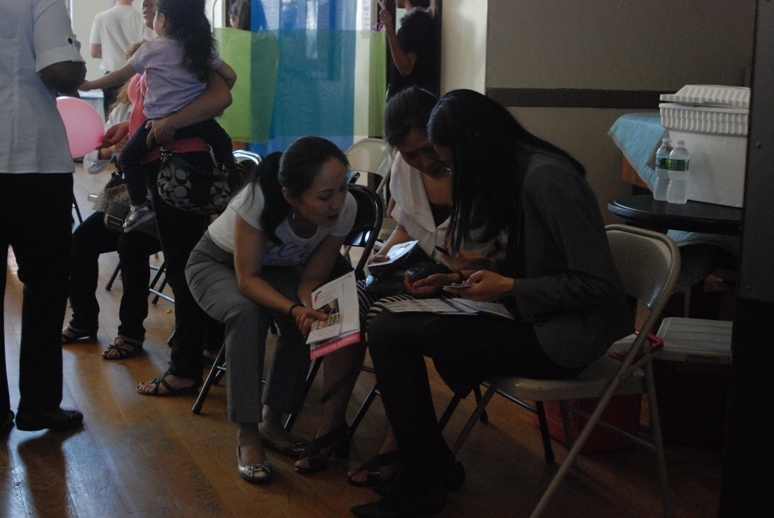 Brochures, information and other materials were also available in Spanish and the AMPHS team was also staffed with Spanish speakers who assisted with taking medical history and translating between the community member and clinical volunteer. The Sunset Park neighborhood of Brooklyn, NY, characterized by largely Hispanic/Latino and Asian immigrants, has the highest percentage of residents who reported that they do not have healthcare insurance or a personal primary care physician, and the second highest that can not afford to pay for their prescriptions, according to SUNY Downstate Medical Center’s Community Health Report 2007 (1) and Center for Family Life in Sunset Park Progress Report 2008 (2). The majority of community members perceived their health as fair or poor according to the same report. 24% of Sunset Park residents live in poverty, including 34% of children and 33% of senior citizens (2). Many residents have a fair or no command of English, and almost half of the population have not received a high school diploma (1). Hispanics overall continue to be highly underserved in the healthcare arena. AMPHS screened a total of 28 Sunset Park community members, many of whom were Hispanic, unemployed and not having access to healthcare or healthcare insurance. “To be a part of the free health screening was truly special and reinforced the need for AMPHS to continue its mission to serve the underprivileged community,” said Mrs. Adriene Clark, V.P., Community Engagement, AMPHS. Among the vendors who participated were New York City based organizations such as Educational Alliance, Sunset Park Fitness Center who distributed free passes, Children’s Defense Fund, NYC’s Big Apple Rx who canvassed the neighborhood with discount prescription cards, and Project Renewal, who conducted free mammogram screenings. Nurses from National Action Network, Rev. Al Sharpton’s civil rights organization, lended their helping hands in screening community members. Products from the Vitamin Shoppe, the official in-kind event sponsor, such as immune balance lozenges and vitamin C chewy snacks, were made freely available to community members. Healthy choices of snacks and fruit smoothies were also available for purchase. There’s no question that healthcare insurance, resources for doctor visitations and crucial healthcare screenings are desperately needed in Sunset Park. AMPHS is prepared to expand their service offerings, partner with area hospitals, and host many of these health fairs and community events to assist with these challenges. The larger challenge and opportunity is marketing and promotion. On the health screening feedback survey, community members indicated that AMPHS clinical volunteers behaved professionally towards them, spent sufficient time with them, and answered all of their questions and concerns. All community members indicated that they would participate in a future screening, and refer their friends or relatives to participate, if another fair were offered. 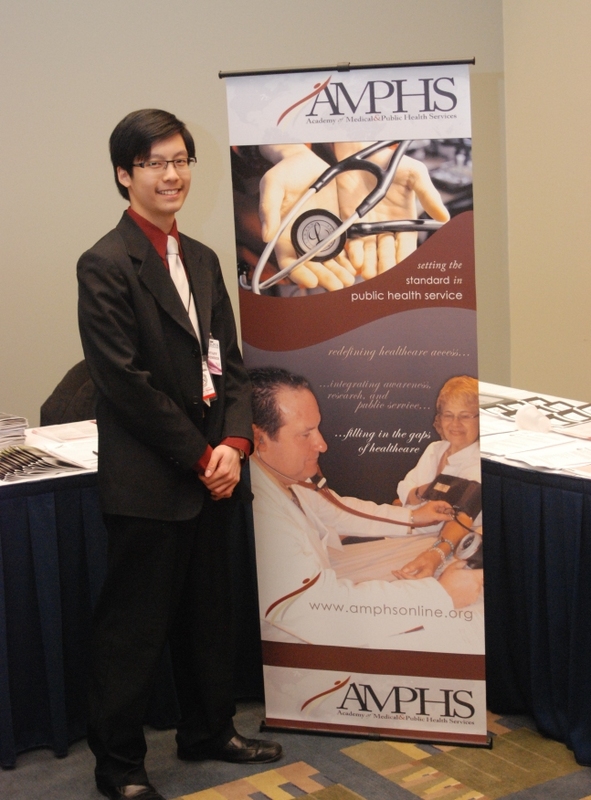 Academy of Medical and Public Health Services (AMPHS), President & CEO, Hewett Chiu, was recently nominated for recognition as the Young Nonprofit Professionals Network of New York City’s 2012 Nonprofiteer of the Year. Join AMPHS in congratulating him for his nomination. Send Hewett your congratulatory note below! Academy of Medical and Public Health Services (AMPHS), announced that their President and CEO, Hewett Chiu, was nominated for recognition as the Young Nonprofit Professionals Network of New York City’s 2012 Nonprofiteer of the Year, and is one of the five (5) finalists. The Young Nonprofit Professionals Network of New York City (YNPN-NYC) supports the professional development of the next generation of nonprofit leaders by providing opportunities for skill-building, information sharing, and networking. “Hewett founded the Academy of Medical & Public Health Services as a college freshman to fill in the gaps of healthcare. He wanted to increase healthcare access to underprivileged community members, making healthcare not a privilege, but a basic human right. 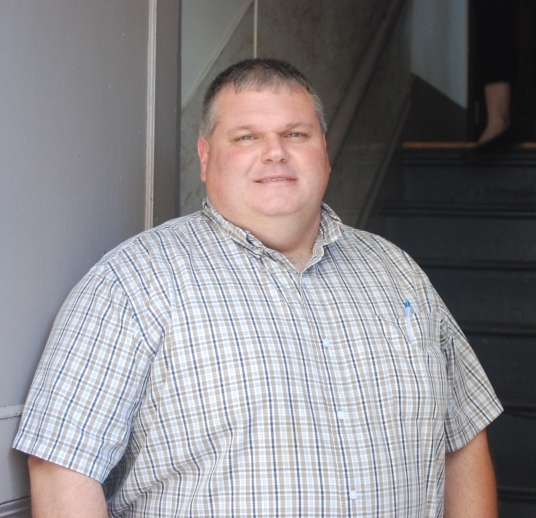 In just two years and devoting a minimum of 20 hours per week to the cause, he grew the organization to become a recognized leader in health access as a community referral center. Hewett built a strong team of over 40 volunteers, completed over 215 free comprehensive community health screenings for cardiovascular risk factors, developed and implemented a sustainable community health model, and opened a community patient library for health education and research,” said one of his supporters. All five finalists will be honored and the 2012 Nonprofiteer of the Year will be announced at YNPN-NYC’s upcoming anniversary event on June 28th. AMPHS congratulates President and CEO, Hewett Chiu, for receiving this prestigious nomination. Academy of Medical and Public Health Services (AMPHS) announced this week that they will be launching their new branded community health program called “myamphs Community Membership Program” at the Know Your Health Status Awareness Day Health Fair in Sunset Park, Brooklyn on Saturday, June 23, 2012.
myamphs Community Membership Program is part of a larger campaign the organization launched called “myamphs” that brings together all of AMPHS’ diverse programs and volunteer, donor, community member, professional member, and community and government leader stakeholders into one unified body. The myamphs brand signifies a common experience that is personal to each and every contributor and participant of the AMPHS vision and mission. So what does “myamphs”mean for community members? The newly branded “myamphs program” will have the greatest benefit overall for community members who do not have healthcare insurance and/or do not have access to medical services. Any community member can continue to receive personalized and customized basic health care services under Academy of Medical and Public Health Services new branded community health program called the myamphs Community Membership Program. Under the myamphs Community membership program, each individual community member will still receive their basic biometric healthcare screenings, nutrition and lifestyle choices consultations, in-depth individual evaluations, health access and coverage assistance (HACAP), prescription assistance, resources and referrals, and follow-up consultations, but now will be able to refer to the program by its new, more personalized name. myamphs Community Membership program’s goal is to provide individuals and families living without access to healthcare and healthcare insurance with much needed healthcare services, resources, tools and incentives to empower and motivate them to care for and better maintain their and their family’s health and wellness. The program seeks to retain all community members that have initially gone through healthcare screenings so they can receive better assistance with managing their health. With the myamphs mywellness+ card, community members with or without healthcare insurance who want to participate in the program will have the opportunity to receive personalized follow-up consultations at AMPHS, take advantage of discounts at select merchants and other free or low cost incentives. myamphs’ HACAP will also include an open access component whereby undocumented immigrants in New York City will be eligible to receive healthcare services. This component of the program will be launching this summer. So where ever you see the myamphs Community Membership logo, know that taking better care of your health and wellness is within your reach, no matter what your financial and economic circumstances are. Detailed information about the program will be available at AMPHS “Know Your Health Status” Awareness Day Health Fair on Saturday, June 23, 2012 and on the AMPHS National Website: amphsonline.org/national (on a near future date), at which time any community member can sign up to be a program member. Ask any AMPHS staff member about the myamphs Community Membership Program for more information. To date, the myamphs Community Membership program is only available to individuals who reside in select areas of Brooklyn and Queens. Academy of Medical and Public Health Services (AMPHS), a non-profit healthcare organization, is pleased to announce that Children’s Defense Fund, National Action Network, and Raising Women’s Voices will be participating in its “Know Your Health Status” Awareness Health Fair on Saturday, June 23, 2012. Children’s Defense Fund, a non-profit organization in lower Manhattan that serves children and youth from impoverished families in the areas of justice, healthcare and education, will be providing needy families in Sunset Park with valuable information and resources to healthcare and healthcare insurance for their children. Raising Women’s Voices is a national initiative working to ensure women’s voices are heard and their concerns are addressed as policymakers put the new health reform law into action. Registered nurses from National Action Network”s Health and Wellness Committee, led by Ms. Queenie Huling, Chairperson, will also be in attendance to lend a helping hand to AMPHS in anticipation of the large turnout expected at the event. Ms. Lisa Williams, RN will be one of the nurses present at the event. 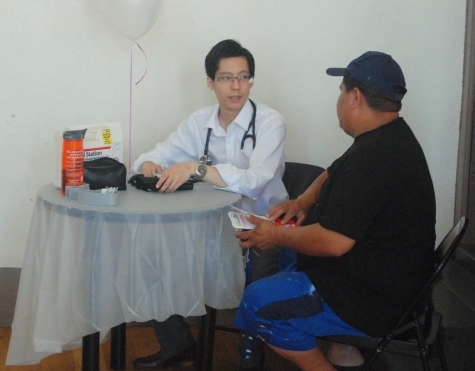 “We expect this to be a wonderful event full of health screenings, health and wellness consultations, access to public healthcare resources, information, healthcare policy, fun and giveaways for the community of Sunset Park,” says Mr. Hewett Chiu, President & CEO, AMPHS. “There is something from which every community member can benefit at this health fair, whether it be for themselves, their friends, relatives or children” he continues. Academy of Medical and Public Health Services (AMPHS), a non-profit healthcare organization based in Sunset Park, Brooklyn is pleased to announce that Vitamin Shoppe has agreed to be an official sponsor of our “Know Your Health Status” Awareness Day Health Screening on Saturday, June 23, 2012. Vitamin Shoppe has generously agreed to donate a variety of health and wellness products to the health fair. At the health fair, we will provide a variety of free healthcare screenings to the local community of Sunset Park, Brooklyn. Trained clinical volunteers will perform healthcare screenings, which include blood pressure, body mass index (BMI), heart and respiration rate, memory and cognition screenings, and other free biometric screenings. 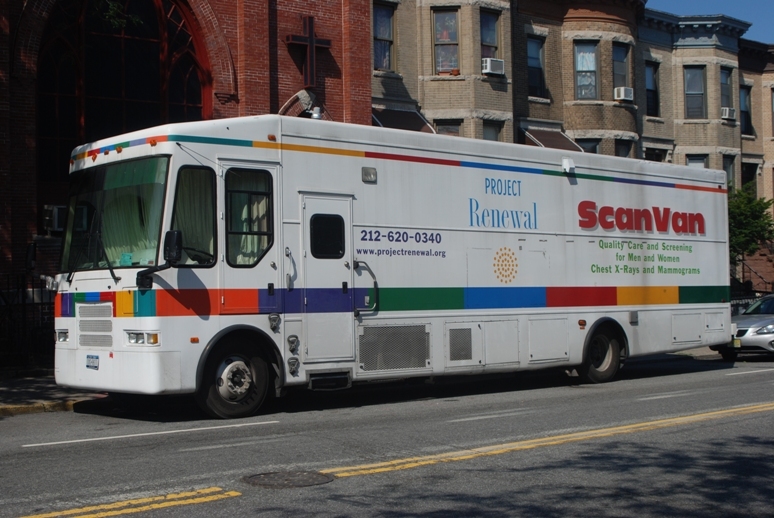 We’re collaborating with Project Renewal who will conduct free mammogram screenings onsite, and Interfaith Medical Center who will conduct HIV screenings. We welcome people of all ages, genders, races and cultural backgrounds to participate in this event. All health screenings are non-invasive and strictly confidential. Academy of Medical and Public Health Services (AMPHS), a healthcare non-profit organization based in Brooklyn, NY, announced yesterday that they have been selected as the 2012 Bridging the Gap Grant Recipient from YouthBridge-NY, a non-profit organization in New York City. “The committee was deeply impressed by the work [AMPHS is] doing to create positive change for youth in NYC. [AMPHS’] work is important and inspiring” said the YouthBridge-NY Youth Committee. AMPHS has been awarded USD$650 from YouthBridge-NY Bridging the Gap Fund to help fund the Community Health Project’s free health screenings and consultations. YouthBridge-NY is a non-profit leadership development organization that convenes and trains young people to meet the challenges of an extremely diverse New York City. YouthBridge-NY Bridging the Gap supports other organizations in three (3) areas including efforts made toward promoting and fostering individual and community health. AMPHS has been invited to receive their award at YouthBridge-NY’s A Night of Celebration at the offices of Kramer Levin Naftalis & Frankel LLP in Midtown Manhattan on Wednesday, June 6th. About YouthBridge-NY: YouthBridge-NY is a non-profit leadership development organization that convenes and trains young people to meet the challenges of an extremely diverse New York City. YouthBridge-NY is devoted to improving the atmosphere of respect and diversity in our city and the schools and community organizations in which our youth leaders live and learn. YouthBridge-NY youth leaders are proactively involved in the leadership and diversity landscape of our city and are dedicated to improving the quality of life for all.